I am so thankful for this verse, as it reminds me that God never gives up on me. He continues to believe in me and work in me, no matter how many times I fail. Being a mom is so much harder than I ever fathomed it would be. There are days when it seems I look at the clock every 10 minutes to see if it is over yet. There are days I feel like I could just tape record myself and put the recording on an endless loop, as I seem to have to repeat things so many times. There are many days when I wonder 'what was I thinking...what did I get myself into'. But, fortunately, God continues to work in me. He continues to give me grace and patience. He reminds me that I, myself, have to hear things over and over and over before I 'get it' and obey. Finding joy in my role as a mom. Releasing the need for validation from places other than God and my family. Learning to be less selfish with 'my time' (ie Sage's naptime). Doing dinner prep during this time, so I can be freed up to focus on Regan when she gets home from school. Paying bills and organizing paperwork during this time so the 'pile' is staring at me the rest of the day and causing frustration. Doing a little bit of cleaning so the house isn't totally neglected. Spending less time at the computer while my children are eating breakfast and lunch. Spend more time interacting with them while we are eating breakfast and lunch. Minimizing the time the girls spend in front of the TV. Include the girls in making meals and baking and such instead of trying to find something to occupy them so I can do it myself. Pray for wisdom in discipline methods and patience and grace when executing them. Nurturing the 'I can do anything through Him who gives me strength' attitude. 3But among you there must not be even a hint of sexual immorality, or of any kind of impurity, or of greed, because these are improper for God's holy people. 4Nor should there be obscenity, foolish talk or coarse joking, which are out of place, but rather thanksgiving. 5For of this you can be sure: No immoral, impure or greedy person—such a man is an idolater—has any inheritance in the kingdom of Christ and of God.a]">[a] 6Let no one deceive you with empty words, for because of such things God's wrath comes on those who are disobedient. 7Therefore do not be partners with them. 15Be very careful, then, how you live—not as unwise but as wise, 16making the most of every opportunity, because the days are evil. 17Therefore do not be foolish, but understand what the Lord's will is. 18Do not get drunk on wine, which leads to debauchery. Instead, be filled with the Spirit. 19Speak to one another with psalms, hymns and spiritual songs. Sing and make music in your heart to the Lord, 20always giving thanks to God the Father for everything, in the name of our Lord Jesus Christ. May God continue to help me make the most of every opportunity with my girls and help me to be thankful for the chance to be the primary influence in their life, at least for a season. Well, tonight I took my turn sharing my favorite thing. Today, out of the blue, Sage wrapped her little arms around me as far as she could and said 'Your the bestest Mommy in the whole world'! How can that not melt your heart! It almost made me cry as I thought about this past week and how I haven't really felt like the 'bestest' mom in the world. I have been sick for a week and a half and my parenting has consisted mostly of television. My mood hasn't been the best, either, as I have battled headaches for most of those days and they tend to make me grouchy. It made me realize how unconditional their love is and how simple their minds are. What a blessing that they don't hold grudges and resentments and frustrations against us when we fall short of perfect as parents. If only I could learn how to do that with others. Once again, I am left to learn life lessons.....from a three year old. 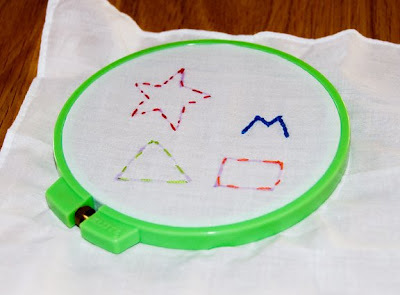 A couple of the blogs I follow have been showing some hand embroidery projects and I was inspired to maybe give it try myself. I used to do a little bit of it when I was young, but have not tried anything in a long time. I was even encouraged by Shalae's post to maybe let Regan try her hand at it. When I found this book, unused, at our second hand toy store for $7, I was left without excuses!! I had been working on a small project, teaching myself the 'chain' stitch (the M on the sample). Regan kept admiring it everytime she would see it. Finally, last night, I asked her if she would like to try sewing. Her eyes lit up! She even opted to skip out on watching 'Open Season' with Daddy and Sage, to keep sewing. I drew the star out first and then knotted the thread and put it through the needle for her. I held the hoop and would flip it back and forth for her while she 'sewed'. I explained to her how you want to try and keep your stitches kind of small and sort of the same size. After she finished the star, she didn't want to stop! The triangle and rectangle she did completely on her own. I helped with the knotting and threading the needle, but she did the rest all herself! Well, somehow my little baby has turned three today! We had some fun conversations today while Regan was at school. I thought I would try my hand at posting them here!! We celebrated on Saturday with our friends, the Kosters. Nothing fancy. Dinner and cake and ice cream. I took the girls to Sam's Club in the morning and let Sage pick her cake from the pre-made ones. She found a cute valentine's arrangement of a 5" cake and 10 cupcakes. The key selling point...each cupcake had a heart ring on it! Before we even left the store, the girls had deliberated who was getting what, depending on whether 'the boys' (AJ and Cam) wanted any!! lol!! We then went to ToysRUs for a birthday crown, balloon and token for a free meal at Texas Roadhouse. Found a few bargains in the clearance stuff and picked up Outdoor Challenge for the Wii. We have been having a great time with the new Wii game. I has a mat that you put on the floor and you have to run, jump, paddle, etc, depending on what sport you are doing. Regan and I have aching calves!! Whoever chose the name for the kid's meals at McDonald's was very insightful. If you could have seen the two girls excitement when we told them we were going to 'old McDonald's' for dinner, you would know why I say that. We don't go out to eat that often, but it's fun to splurge once in a while and the joy on their faces was worth every penny. Chicken nuggets, apple slices, chocolate milk for Regan and apple juice for Sage...and two pink Hello Kitty watches was all it took to make their day. But who left the happiest of them all? Mommy, because I didn't have to cook dinner! lol!